Product prices and availability are accurate as of 2019-04-18 20:24:36 UTC and are subject to change. Any price and availability information displayed on http://www.amazon.com/ at the time of purchase will apply to the purchase of this product. Author Bookstand is proud to offer School Leadership: Managing Public School in the Philippines by Bookstand Publishing. Bookstand Publishing offers books by the best indie authors throughout North America and the world. Bookstand Publishing is dedicated to offering original content to a broad audience and promoting great authors, literacy, and freedom of expression. 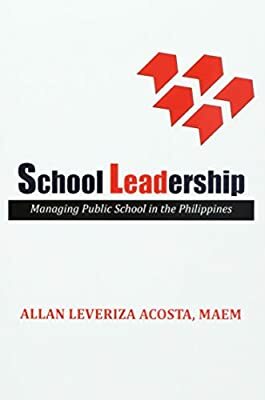 School Leadership: Managing Public School in the Philippines has generated a lot of interest and excitement and we think it would be an excellent addition to your library. "It is much noble to lead when subordinates respect the leader not by his position but because of his convictions toward the good of the organization. Simply put, his or her mere presence, words and actions inspire the people. With authority goes accountability to safeguard public interests as stipulated in RA 9155 otherwise known as the 'Governance of Basic Education Act of 2001' which set the framework for basic education, its authority and accountability. 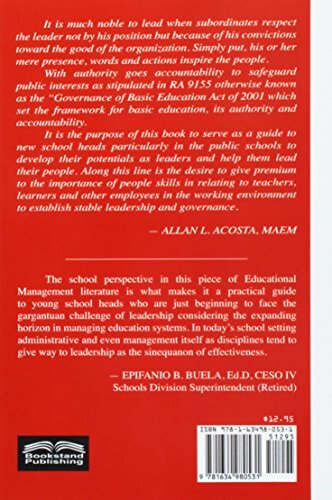 It is the purpose of this book to serve as a guide to new school heads particularly in the public schools to develop their potentials as leaders and help them lead their people. Along this line is the desire to give premium to the importance of people skills in relating to teachers, learners and other employees in the working environment to establish stable leadership and governance." --ALLAN L. ACOSTA, MAEM. "The school perspective in this piece of Educational Management literature is what makes it a practical guide to young school heads who are just beginning to face the gargantuan challenge of leadership considering the expanding horizon in managing education systems. In today's school setting administrative and even management itself as disciplines tend to give way to leadership as the sinequanon of effectiveness." --EPIFANIO B. BUELA, Ed.D, CESO IV, Schools Division Superintendent (Retired).